As I was scanning the recipes for Seville sour oranges I saw one for fried plantains. 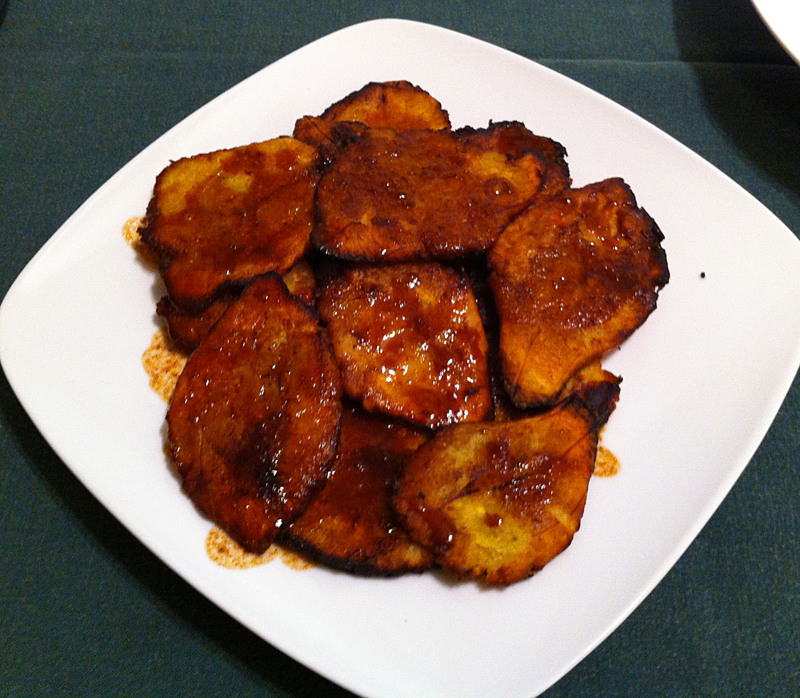 I thought that the plantains would do well with a sweet and sour sauce. I decided that it would make a good side for my taco dinner. The only problem with my original recipe was that there was not enough sauce. I doubled the sauce quantities in the posted recipe. 1. Peel and slice the plantains about one half inch thick on the diagonal. 2. Add the oil to a large pan and fry the plantains until golden brown. 3. Remove the slices from the pan and cool them slightly. Press the slices flat to about 1/8 of an inch thick. Tip: A bacon press or flat pot lid works very well for this task. 4. Fry the slices a second time until crispy. Tip: Keep a close eye on them as you are frying. They go from crispy to burnt in seconds. 5. Remove the plantains to a paper towel and pout off any excess remaining oil. Tip: You want only a thin layer of oil remaining in the pan. 6. Add the juice, sugar and spices to the pan and cook for 4-5 minutes, until it has started to thicken. 7. Move the plantains to a serving plate and spoon the sauce over them.